In November 2014, China announced plans to obtain 20 per cent of its energy from renewable sources by 2030. Part of the plan to reach that goal is investment in the solar industry. China is targeting 17.8 gigawatts of new solar energy installations in 2015 alone. And the country’s 13th five-year plan is expected to set a target of between 100 and 200 GW for photovoltaic. So it’s worth taking a look at the Chinese solar industry. Seven of the ten largest solar panel manufacturers in the world are Chinese. Key elements such as polysilicon, solar cells, inverters and cables are made in China. Suppliers are concentrated in specific locations such as the Yangtse River Delta. So supply chains are shorter and more cost-efficient. Many Chinese solar companies benefited from low interest state loans to grow around 2010 to 2011. That’s also one reason photovoltaic costs have fallen world-wide – another factor driving growth. Unfortunately, the falling costs mean low returns for panel manufacturers. They’re operating on razor-thin margins. Ambitious domestic solar targets are a life-saver for the Chinese solar industry. They certainly helped photovoltaic production exceed US$31 billion in the first half of 2015. 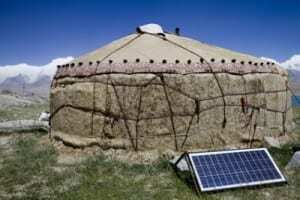 Of course, not all Chinese nomads have solar panels outside their yurts like this picture. But if you want to see how solar has taken off, check out these NASA photos showing how solar production has increased over time. The Ministry for Industry and Information Technology reports that China exported US$7.7 billion worth of silicon wafers, batteries and modules in the first half of 2015. That compares to $8.2 billion during the same period last year. Why did the value of exports drop? There’s increasing competition from other countries for low-end production. Wang Bohua, secretary general of the China Photovoltaic Industry Association, mentions Malaysia and India in particular. Interestingly, India is in the top three export markets for Chinese photovoltaic cells. The other top markets are the US (despite high import tariffs) and Japan. Interest in clean energy has been high in Japan since the Fukushima disaster. And a 2014 report from the United Nations Environment Program says that developing countries now make up a quarter of China’s photovoltaic exports. 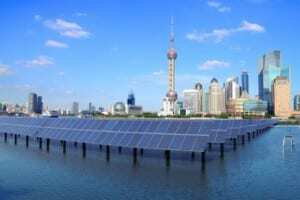 What about Australian solar imports from China? Australia’s solar panel industry is centred on rooftop installations. It depends on imported panels. 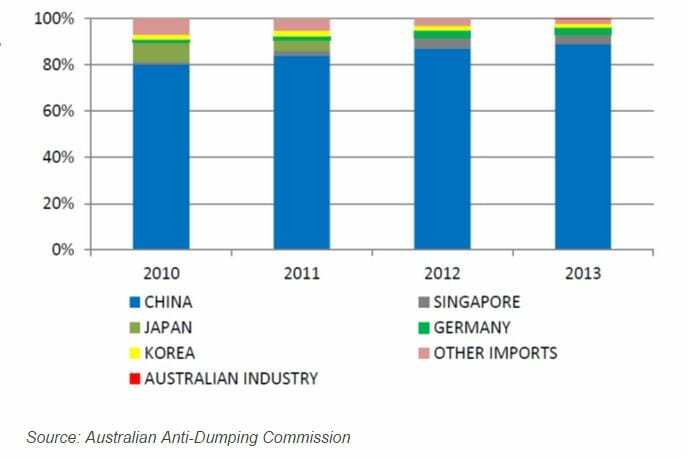 As this figure shows, the vast majority of Australian solar panels come from China. So why are prices for solar panels in Australia so low? Low enough that the Anti-Dumping Commission investigated them, although the case was finally dismissed. Possibly it’s because the market size is so small. We’re a good place to dispose of overproduction. This works fine as long as you don’t want a customised product. The key question for the Australian solar industry is not so much where to source solar panels. It’s what government policy will be. The Renewable Energy Target will require around 6000 MW of new capacity to be built by 2020. This includes all renewables, not just solar. But there is opportunity for both large-scale and small-scale solar projects. Installation rebates and feed-in tariffs will affect adoption of rooftop solar schemes. Get updated rebate information here. Whatever the policies, the Australian solar industry is maturing and competition is intense. Individual companies will need good marketing and efficient processes to retain and grow business.